This is the advice that international student Tarique Plummer has for new students at Wilfrid Laurier University. Now in his third year of a BSc degree in Biochemistry/Biotechnology, Plummer has spent much of his life seeking new opportunities. He’s most recently been elected as chair of the Wilfrid Laurier University Students’ Union Board of Directors for the 2017/18 term. Years ago, when the time came to attend university, the young student from Jamaica knew he was ready for an immense challenge. “I wanted to see how other countries study and implement change and how what I learned could be applied to Jamaica,” says Plummer. University abroad would be a unique experience: where would he go and would his plan be feasible? Studying in Canada was a straightforward decision for Plummer. The immigration process and affordability of tuition were important factors. But how would he decide which university to attend in a country with nearly 100 of them? “I developed a process to call, email and Skype as many Canadian universities as I could find — and I was going to be as annoying as possible to all of them,” says Plummer. He wanted to find the universities that would value him more than just a dollar sign. “The list of schools quickly dropped,” he says. Plummer points to Laurier’s international ambassador as having a major influence on his decision to study in Waterloo. With a Laurier scholarship in-hand, and relationships being built before his first day even started, Plummer knew he made the right decision about becoming a Golden Hawk. 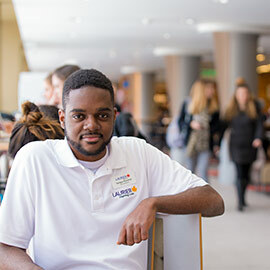 Though Plummer left his entire family in Jamaica, he quickly immersed himself in several activities at Laurier, forging new friendships along the way. “I may have become a bit lonely during holidays, for example, but one of the ways I dealt with those feelings was by becoming involved,” he says. In first year, he served as vice-president of Training and Development of Bricker House Council, vice-president of the Caribbean Students Association, first-year executive representative of the Laurier Chemistry Association, an English mentor, and international ambassador with Laurier International. Plummer spent his first year living alongside science students in a Residence Learning Community (RLC) — a themed residence environment where students share a common interest, major or coursework. Plummer also worked in the dining hall and held an off-campus job, while getting involved in campus journalism by writing for the university newspaper, The Cord, and working as a radio journalist for Radio Laurier. In his second year, Plummer stayed just as involved in life at Laurier. “I love interacting with and helping students, so I became an instructional assistant in the department of Chemistry and joined the Faculty of Science Students' Association as vice president of research and development,” he says. In addition to being a resident advisor, Plummer became a director with the Ontario Science Students’ Association and served as the club governance coordinator for the Wilfrid Laurier University Students’ Union. This year, Plummer joined Laurier’s Board of Governors, as one of three student representatives, and is a residence don and sports club coordinator at the Athletic Centre. He also works with the Lazaridis School of Business and Economics as a research and conference planning facilitator. Reflecting on his time at Laurier so far, Plummer stresses that students should seize the opportunity to get involved. “You can get a degree at the end of four years that says Laurier, but that’s not the Laurier way,” he says. “The Laurier way is interacting with people and making a difference — and the only way you can do that is by getting out there and getting involved in what you’re passionate about.